Did that really happen, or was it all just an incredible dream? Indeed, it was for real -- and so they say, even B16's choice to lead the nation's largest local church couldn't help but wonder if the magnitude 7.2 earthquake that shook Southern California on Easter night was some sort of omen. The news-cycle might've moved on (at least, where it was covered at all). On this one, though, the moment needs to be savored a bit longer, that what it means might fully sink in. Or, at least, begin to. Not since January 1984, when John Paul II named John O'Connor -- installed but seven months earlier in Scranton -- to the archbishopric of New York has an appointment come that'll impact the American Catholic landscape the way José Gomez's ascent to LA already has, and will all the more over the years to come. Literally overnight, as one leading op put it, on the stage of national leadership, "the matrix has changed." Revolutionized might be an even better word. Because to speak to the Stateside church's reality in these days, no credible voice can fail to reach the group that'll comprise its national majority within a decade: half its members under 25; already over half the pews in locales just starting with LA, New York, Atlanta, Chicago and Houston; the heart and soul of the shift that's seen these shores' demographic center of the faithful leap dramatically, seismically, toward the South and West, likewise returning the core of its spiritual emphasis to the simple, attractive basics of the faith… and, as the bottom line goes, the only attribute that's kept the numbers of several large and venerable sees from experiencing a precipitous fall. All that said, it was far from certain that the time would come this time around. For several months in advance of Tuesday's appointment, the objections over a Hispanic nominee were prominently circulated behind the scenes -- not ready for "prime time," ill-prepared to face the staggering administrative burden at hand, concerns over how the Anglo donor-base would receive the move… you get the idea. But in the end, as he's done more often than not these last three decades, Roger Mahony won the day. And the cardinal's emphatic expressions of gratitude over the selection of his Latin heir-apparent only underscored the degree to which the process' unprecedented result was, by no means, a fait accompli. Sure, Gomez comes to the nation's undisputed progressive seat with a more traditional mind in some matters of the church's life and practice. But where and when that shows, it's important to remember that the message comes couched in a tone that, both in its pastoral and ethnic roots, departs notably from more Anglo-influenced articulations. "Conservative"? Of course -- at least, as the moral teachings (which seemingly define all else in the commentariat) go. But if one's going to play the labels game, "pastoral conservative" might be a more accurate fit -- and one that, arguably, encapsulates this pontificate's major appointees across the board. Early on in the process, it was indicated that the eventual winner of the bench's biggest prize was a man "Roger can do business with." And as the chancery goes, to quote one Gomezite, "delegation is his middle name" -- in Mahony's coadjutor, B16 has tapped a figure who might have a degree in accounting, but in reality has been far more invested and fulfilled in being a pastor and teacher than running the nuts and bolts of the shop. 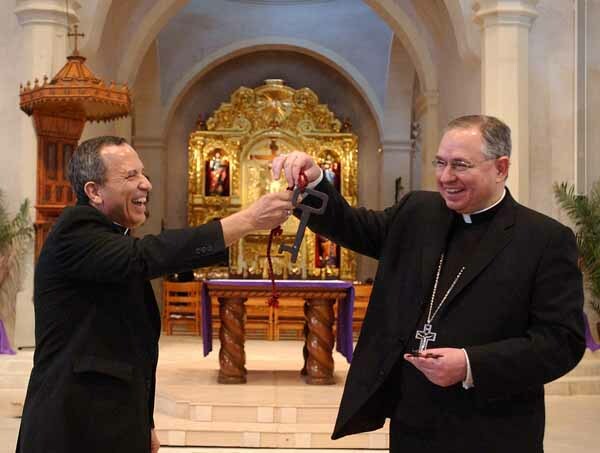 This time around, even for the archdiocese's considerable fiscal challenges of recent years, Gomez walks into an infinitely healthier set-up, with the added luxury of the coadjutor period to get up to speed before taking the reins next spring. Possibly more than anything in the realm of practice, how the incoming archbishop adjusts the structure that serves more American Catholics than any diocesan administration in history stands as one key defining question for the road ahead. Still, let's keep our eyes on the ball: this move's greatest import doesn't lie in the office… if anything, far from it. 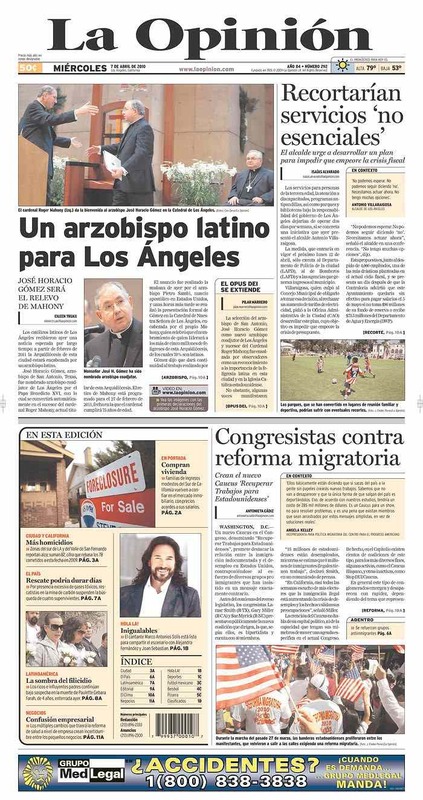 Directly, the appointment will impact the more than 5 million Catholics of the Angeleno church: Latino, Anglo, Asian/Pacific -- one of every 13 Catholics on these shores. 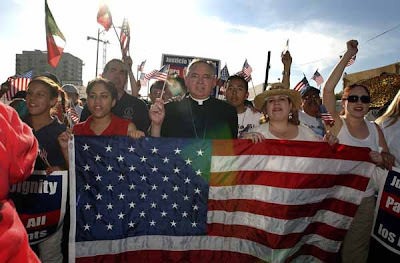 Yet over and above all else, in terms of voice, pride, and a place at the table, Gomez's rise signifies the definitive, unparalleled arrival of the fold's 30 million Hispanics nationwide -- a figure only set to keep growing and, with it, an ever more pronounced reboot of the mind, message and spirit of the Stateside church. Ecclesiologically and administratively, some things will, in time, change -- they always do. And some will, no doubt, seek to use the moment for wish-lists or commentary that looks less to the sea-change than advancing one agenda or another. But it's only with the eye of history that the events of these days can be best viewed. Sizable as other aspects might seem, all else is but a footnote in its sight… and for these purposes, the story begins with a cleric of German-Italian heritage and the ministry whose roots were born on the chicken farm where he grew up. 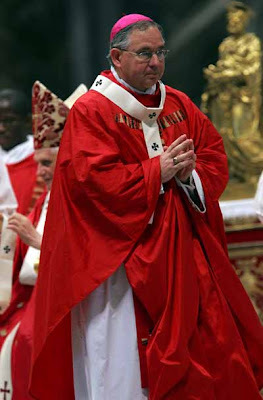 Having devoted the half-century of his priesthood to shepherding his adopted own from the margins and the chapels to their rightful place at the ecclesial fore, the "great survivor" can claim for himself and his legacy the ultimate vindication. A year from now, having built the empire his way -- the West's way; led the rest of the church in presence and service to its emergent future, bucked the prevailing wind to reach his people and, in the process, provided a global lesson that the Council's vision works in unabashedly offering a model of what a diverse, united, joyous and energized crowd of God's people can be and could accomplish, when California's Hughes hands over the chair and cathedral that've immortalized his tenure in wood and stone, the Mahony project will reach its fruition as the City of Angels becomes the capital seat of the Stateside church. For the first time in the five-century pilgrimage of the Stateside church, the West can claim the "American Pope" as its own. And as history goes on the beat, you can't really top that. While we're at it -- and especially with Benedict XVI's fifth anniversary as Pope later this month -- let's take a quick look at an ever-changing bench. His pontificate's most significant pick for the Stateside church now in the books, it bears noting that Papa Ratzinger has now named the current or future heads of 14 of the country's 33 archdioceses. Add in the seven others already or soon to be in play, and a supermajority of the nation's metropolitans will have been chosen by B16 within the next two years. By size, eight of the nation's 25 largest local churches are now led by the current pontiff's appointees, with another five of those to follow suit over the next year and a half. 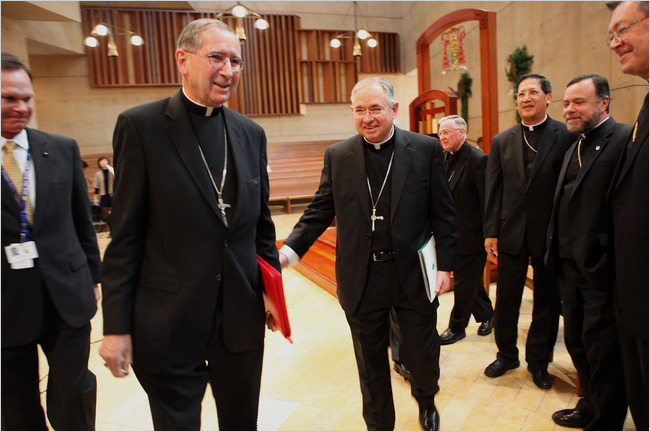 With LA handled, attention now turns to two other Top 25 selections reportedly in their final stages: the archbishoprics of Miami and Seattle, both featuring richly diverse Catholic populations in the 900,000 range on the back of sizable growth these last three decades. 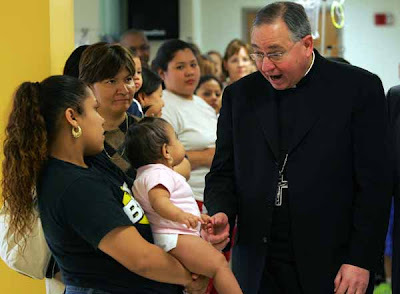 Lastly, it should come as no surprise that the chatter’s already begun in earnest over Gomez’s succession in San Antonio, long considered the American church’s “Latin seat” given its back-to-back Hispanic archbishops, beginning with the legendary Archbishop Patrick Flores, named in 1979 after the locals petitioned Rome for his selection. It’s very early, of course, but two starting points are worth noting: first, it’s been Benedict’s custom to give heavy weight to the assessment of the prior ordinary when the pontiff’s asked a special favor of him, so Gomez’s input will likely be key to the outcome. 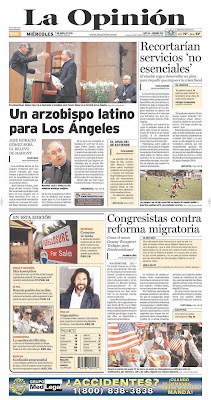 Secondly, though, with the “Latin seat” distinction now having rocketed Westward -- to a post light years larger -- and given a national demand for Hispanic prelates that far outstrips their supply, the odds of a hat-trick might be considerably less than some might think or wish. On the other hand, though, who said there couldn’t be two Latin seats? As ever, only time will tell. As of this writing, four (Latin-rite) Stateside dioceses stand vacant, with another four led by an ordinary serving past the retirement age of 75. The latter figure rises to five in ten days’ time, as Philadelphia’s Cardinal Justin Rigali reaches the milestone. Bishop Kevin Boland of Savannah likewise turns 75 at late month. "The Hispanics Are Thrilled to Death"